Ravi Subramanian is back with another exciting masterpiece! I was lucky to get my hands on the autographed first edition which released last month. Are you all set to read the review of the world's first bitcoin thriller? 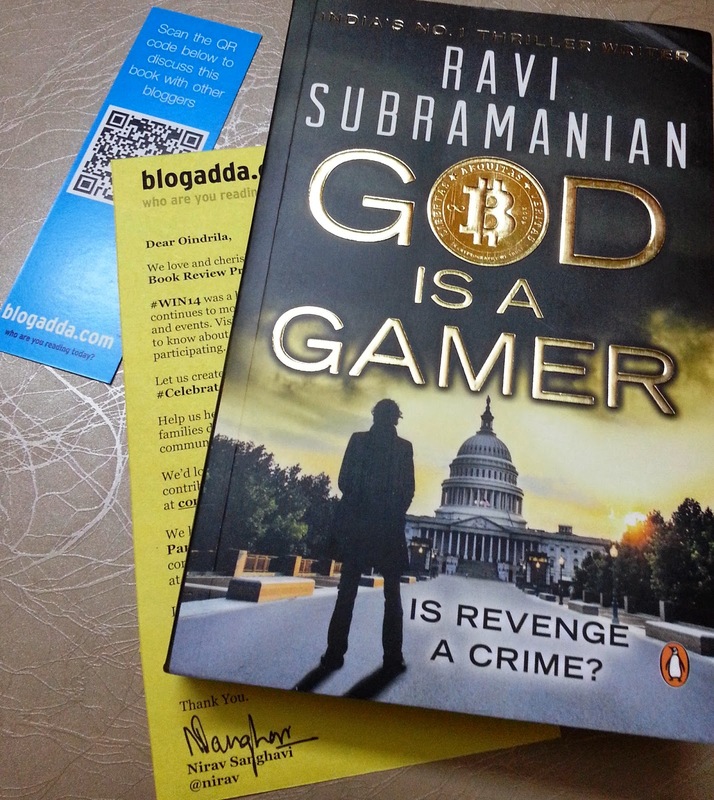 'God Is A Gamer' is the latest offering by Ravi Subramanian, a rising star in the US financial-thriller space. The story alternates between Washington D.C. and Mumbai, where two seemingly unrelated incidents shock the White House and corporate boardrooms of Mumbai, respectively. The scene opens with the death of US Senator, Gillian Tan, in a car explosion executed using the Misznay-Schardin effect. FBI Agent Scott immediately gets on the case. A few days later, another incident sends shockwaves through NYIB - the accounts of several NYIB customers are compromised and 5 million dollars are siphoned off through dozens of ATMs in New York. Malvika, the New York CEO of NYIB, puts the blame on Swami, the Head of Retail Banking, which eventually costs her the CEO-position as she is relegated to the passive role of a Chairman. Swami, meanwhile, fumes as he is increasingly seen as a weak leader and struggles to build a good rapport with Matt Metzger, the new CEO. In a separate scene, Varun, Aditya's estranged son, is reunited with his father who helps bail him out of jail, something that wouldn't have been possible without Malvika's intervention for she is connected with New York's most powerful men in the government. Varun and Tanya, Malvika's daughter, fall in love with each other after a number of chance meetings. Aditya lets Varun handle the business of Indiscape's newly launched game, Townsville. Varun uses his genius to take Townsville to the top of the charts from its previously dismal performance, and wins Aditya's confidence. Two scandalous deaths in NYIB ups the tempo of the tale and puts pressure on the CBI to investigate if those are murders. Simultaneously, the stress on Agent Scott mounts as they suspect the involvement of an enormous amount of bitcoins and the use of TOR (a software that keeps its user's online activities anonymous and untraceable) in the Senator's murder and the ATM heist. To add more spice to the story, a prostitute's confessions of her "liaisons" reveal some shocking clues on the case. The FBI and the CBI are led on a wild goose chase as they follow up on a wrong lead and detain an innocent. Will they be able to solve the multiple murders and the 5 million-dollar mystery? Or will the real culprit walk scot-free? You will have to get hold of this novel to find out! Ravi Subramanian has an impressive style and command over his story. His characters are well fleshed out and he describes seemingly innocuous objects only if they have some significance later in the plot. Bitcoins, drugs and stealthy internet usage play a central role in this financial thriller. Ravi has done his research well and succeeds in explaining to the readers the intricacies of this new-age virtual currency. The corporate atmospheres of a gaming company and an investment bank mimic those in the real world, and one forgets this is fiction as the office-politics resemble reality. The book betrays a couple of punctuation mistakes, but otherwise is perfect in its language and form. The story is fast paced and gripping right from the start to the very end. The plot is tight and the epilogue neatly ties up all the loose ends of the story. 'God Is A Gamer' is one of the finest thrillers I have read by an US. Ravi is well on his way to becoming the 'John Grisham of Banking', which he aspires to be. You have finished reading God Is A Gamer - Review and many articles about Tech Gallery in our blog this, please read it. and url link of this article is https://littlebitjohnny.blogspot.com/2014/10/god-is-gamer-review.html Hopefully discussion articles on provide more knowledge about the world of new tech gadgets.